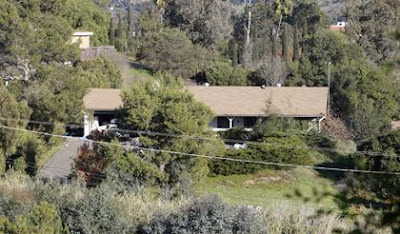 Scores of authorities and explosives experts are burning the "Escondido bomb house" (image, left) in a heavily-populated residential area of Escondido, California. The Escondido bomb house was slated for it's planned-burn at 10:30 Pacific Standard Time but the event has not started yet. Go here to watch the 10 News Livestream video of the Escondido bomb house planned fire. For those unfamiliar with this story, it involves a 54-year-old Escondido man named George Djura Jakubec, a Serbian native and accused bank robber and the discovery of a venerable bomb factory on his property. Several weeks ago a gardener on Jakubec's property was injured as one of the explosive compounds ignited near him. Authorities were alerted and quickly found that the home contained the largest homemade explosives cache found on private property in the history of the United States, including detonators, hand grenades, bottles full of chemicals, boxes of ammunition and unknown quantities of high-grade explosives (PETN, HMTD) - all piled on top of eachother, almost as a "hoarder" would do. Authorities judged that the materials inside the house were deemed to be too dangerous to remove, hence the planned-burn today. Update 10:39: The fire has been delayed due to wind conditions or "a lingering inversion layer" per authorities. 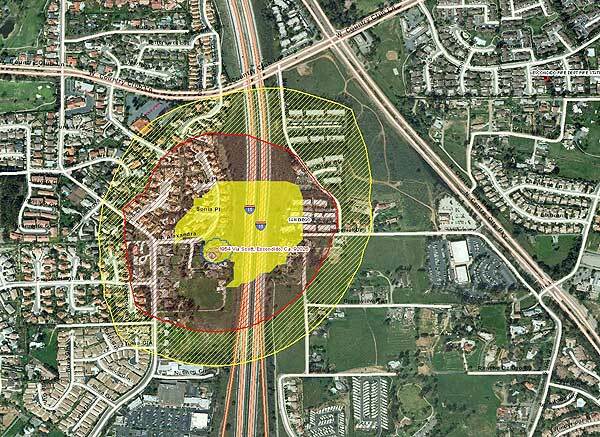 The Escondido bomb house planned-burn is expected to begin at any moment. Devices are set to go inside the house and will activate remotely. Update 10:41: More details here on what is expected when the Escondido bomb house starts burning. Updated 10:57: Thar-she-blows! Black smoke is coming from the roof of the house. A normal house fire typically burns at 1200 degrees, the Escondido bomb house is expected to burn at 1800 degrees. Updated 11:00: Flames are pretty big now but everything seems to be going as planned (crossing fingers). Updated 11:02: The smoke is now super-dark black and rising directly above the home. It's amazing to me that explosives can burn so (nearly) peacefully. Updated 11:04: The smoke is going straight up into the sky, away from homes the conditions seem to be perfect for "a lot of lift" per Fox 5's Chrissy Russo. Updated 11:07: Some pops can be heard as the fire burns, Jan Caldwell of the San Diego Sheriff Dept. says that this is due to the ammunition and grenades in the home. She also said that the fire is expected to burn at for several hours then smolder out. She also claims that the toxic materials are contained and encapsulated inside the smoke - good news for neighboring homeowners. Updated 11:10: Firewall burning? It looks like a section of the 16-foot-tall sheetrock, gel-covered "firewall" is on fire, Jan Caldwell wouldn't confirm. She reiterated that the fire department has every conceivable contingency plan ready to go. Updated 11:13: Burn, baby burn! The entire house is engulfed in flames, a "wicked scene" described by the news crew at Fox 5. Updated 11:16: Jan Caldwell is at the Escondido Fire Department, half a mile from the scene "as the crow flies" and just commented that the smoke's scent can be detected where she is but authorities stress that the toxic chemicals will be diluted by the time it reaches the ground. Updated 11:19: Boom! A big explosion was just seen to the side of the house, probably a large cache going up. Updated 11:26: Still burning and the smoke is incredibly black at this point. Bob Kard of S.D. County Air Pollution Control just mentioned that HazMat will clean up the scene post-fire and that health concerns for those in the area, due to the smoke are unexpected. He told Fox 5 "no toxic gases will be present in the community." I still would feel uneasy if I lived nearby, wouldn't you? Updated 11:30: In a press conference, S.D. Sheriff Department's Jan Caldwell just remarked that "everything is going as planned" and that people will most likely be able to return to their homes this afternoon or evening. She also noted that the "pops" and small explosion that I noted were due to the ammunition caches and hand grenades in the home. Updated 11:32: Experts will now stand by and watch the fire burn itself out. When the fire cools out tomorrow bomb techs will use a "Tackcat," (spelling?) which is similar to a Bobcat with a skipjack to probe the area and check it's safety. I believe she is talking about this. Updated 11:37: Jan Caldwell just stressed that authorities are monitoring toxicity levels and will update if anything changes. Updated 11:40: The smoke is still dark black but seems to be backing off a bit. Updated 11:41: Escondido resident Victoria Kuriger just told Fox 5 that the fire and smoke is now mosly dissipated - she could see the blaze from her home. Updated 11:42: The last remaining wall of the bomb house just fell over. Updated 11:51: The excitement of the event has passed. Obviously every agency involved did a great job today and should be commended. The north and south-bound lanes of interstate 15 are still shut down and expected to re-open this afternoon. Updated 11:55: Homeowners in the evacuation area get to go home today but there property values may be 20% lower than they were before the largest homemade explosives cache was found in the area. Apparently property owners will have to address this issue with their insurance company. Good luck with that. I agree with this guy, "just another day in the 760"
Tim, not to make light of the tragedy that has befell the north county over the past few years, but what the hell is in the water up there? Frankly, I was a little disappointed. It was obvious that Jerry Bruckheimer (sp?) wasn't running the show.